Water and Earth on Central are part of a pair of projects that we designed as a community as well as individual homes. They are also a part of our Elements series of homes. Water and Earth are located close to the intersection of Central and Osborn, within walking distance to some of midtown’s landmarks – the Phoenix Financial Center, the Heard Museum, the Phoenix Theater and Steele Indian School Park. The live- work homes are intentionally located at the heart of the central city only a 5 minute walk to the Osborn and Central Light Rail station and a pleasant walk or bike ride from some of Phoenix’s best restaurants and coffee shops including Lux Coffee Bar, Pane Bianco, Central Wine, Clever Koi and many others. The two buildings share an open space between them and a similar contemporary aesthetic, but each house has a unique architectural expression and elevation. The homes are like sisters, but not identical twins. Both Water and Earth consist of flexible floor plans with one bedroom, two baths, and a flex space that could either be a second bedroom, a home office, a workout room, a meditation room or whatever use fits. The homes are designed to be live-work spaces geared towards creatives and, therefore, are equipped with a large open space with a half bath that can be used as an office, a studio or a gallery. As with all of our projects, sustainability and energy efficiency are at the forefront of our design. At Water and Earth, we used 2x6 framing with R-19 insulation on the exterior walls and R-38 insulation on the roof. We used LED lighting, high-efficiency water heaters, Low-E double pane windows, dual flush toilets, and Energy Star appliances. We also used low-VOC paint and recycled Quartz countertops. The flooring is cooling, beautiful and easy to maintain exposed and sealed concrete. In addition, all the systems in the house are on whole-house automation allowing residents to control everything from their thermostats to the lights to their TVs remotely. Both Water and Earth share the RD Design Team contemporary aesthetic with clean lines and modern materials such as smooth synthetic stucco, painted and natural corrugated metal and rusted metal. The contemporary look and feel extends to the interior, which consists of open spaces filled with daylight and framed views of the city and the courtyard space. The sinks in the bathrooms are custom-designed and are made of folded steel sheets, adding to the uniqueness and artistry of the homes. True to its name, Water boasts a water fountain in its courtyard space, which emits the soothing sound of water as people approach the house. A covered carport with 2 metal chains on either side to capture and guide rainwater also sets Water apart from its sister building, Earth. A woven metal fence at Water adds to the rustic and contemporary aesthetic of the house. Water and Earth embody the values and aesthetics of RD Design Team as evidenced by their central urban location down to the artistic details. 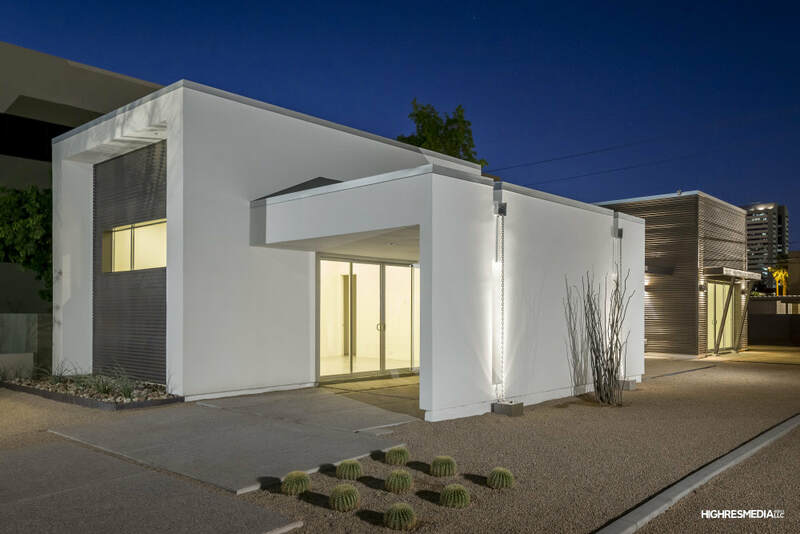 We are proud to offer live-work housing as an option in Phoenix while creating a unique contemporary and energy-efficient architectural style for people to enjoy.